^ Michael Pidwirny. Introduction to the Oceans. www.physicalgeography.net. 2006 [2006-12-07]. （原始内容存档于2006年12月9日）. ^ Tomczak, Matthias; Godfrey, J. Stuart. Regional Oceanography: an Introduction 2. Delhi: Daya Publishing House. 2003 [2007-05-31]. ISBN 81-7035-306-8. （原始内容存档于2007-06-30）. ^ 'Arctic Ocean' - Encyclopædia Britannica. [2012-07-02]. 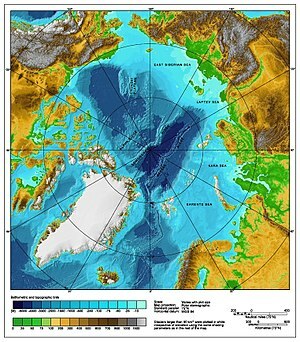 As an approximation, the Arctic Ocean may be regarded as an estuary of the Atlantic Ocean. ^ Pytheas 互联网档案馆的存檔，存档日期2008-09-18. Andre Engels. Retrieved 16 December 2006. 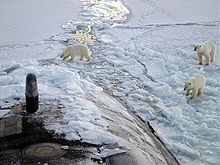 ^ 5.0 5.1 CIA World Fact Book: Arctic Ocean. Retrieved 11 November 2013. ^ Backgrounder – Expanding Canadian Forces Operations in the Arctic. [2007-08-17]. （原始内容存档于2008-08-10）. ^ 8.0 8.1 Physical Nutrients and Primary Productivity Professor Terry Whiteledge. National Oceanic and Atmospheric Administration. Retrieved 7 December 2006. ^ 10.0 10.1 Earth – melting in the heat? Richard Black, 7 October 2005. BBC News. Retrieved 7 December 2006. ^ Russia the next climate recalcitrant 页面存档备份，存于互联网档案馆 Peter Wilson, 17 November 2008, The Australian. Retrieved 2 February 2009. ^ Lauren Morello. Warmer Arctic with Less Ice Increases Storm Surge. Climate Central. 2013-03-05 [2013-03-08]. ^ 400 million cubic meters of radioactive waste threaten the Arctic area 互联网档案馆的存檔，存档日期2007-10-16. Thomas Nilsen, Bellona, 24 August 2001. Retrieved 7 December 2006.